I’m very excited to announce the launch of Immigrant Songs, a cool new series that highlights foreign-born musicians and their music along with unique stories of the immigrant experience. I’ll be curating the series alongside Wo’ Pop host Darek Mazzone. While Derek and I have always championed a wide variety of music from around the world, we’ve also hosted many great live sessions from immigrant musicians and bands from across the US and right here in the Pacific Northwest. I’m excited to delve a little deeper, to not only listen to the music, but hear about the artists’ personal experiences that fed their creative process as well as their take on life as an immigrant and issues effecting their communities. The unique struggles and cultural cross pollinations are inspiring and push music in new directions while bringing worlds together. Immigrant Songs will include live sets that will air on El Sonido and Wo’ Pop, accompanied by video of these live sessions and blog posts that will include extended interviews, stories and much more. It’s a chance for us all to learn about this unique American experience and enjoy some amazing music. 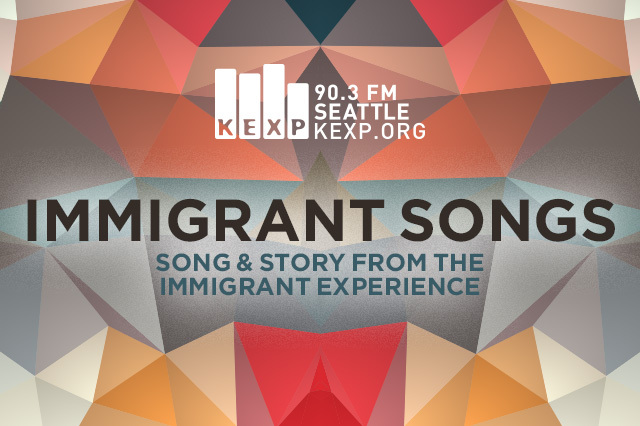 Look for upcoming posts spotlighting Meklit, Chimerenga Renaissance, Dengue Fever and others on the KEXP Blog, and read more about Immigrant Songs here.